Published in The Architect’s Newspaper on 26 September 2016. Entitled “The Architectural Imagination,” the U.S. Pavilion at the 2016 Venice Architecture Biennale exhibits “speculative architectural projects” authored by twelve “visionary American architectural practices” for four sites in Detroit. According to curators Cynthia Davidson and Mónica Ponce de León, these projects comprise “new work that demonstrates the creativity and resourcefulness of architecture to address the social and environmental issues of the 21st century.” Post-bankruptcy Detroit is a city shaped by violent processes of displacement in the form of mass evictions, mass foreclosures, mass water shutoffs, and mass blight removal primarily targeting the city’s working-class African-American families and communities. Taking this city as a field upon which to demonstrate architecture’s relevance, the U.S. Pavilion gestures to architecture’s long colonial tradition of appropriating sites of race- and class-based inequality as laboratories of disciplinary research. 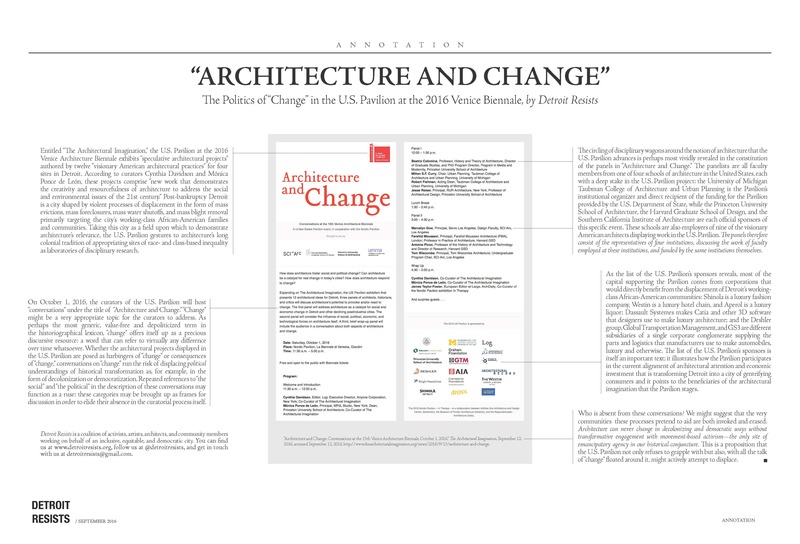 On October 1, 2016, the curators of the U.S. Pavilion will host “conversations” under the title of “Architecture and Change.” “Change” might be a very appropriate topic for the curators to address. As perhaps the most generic, value-free and depoliticized term in the historiographical lexicon, “change” offers itself up as a precious discursive resource: a word that can refer to virtually any difference over time whatsoever. Whether the architectural projects displayed in the U.S. Pavilion are posed as harbingers of “change” or consequences of “change,” conversations on “change” run the risk of displacing political understandings of historical transformation as, for example, in the form of decolonization or democratization. Repeated references to “the social” and “the political” in the description of these conversations may function as a ruse: these categories may be brought up as frames for discussion in order to elide their absence in the curatorial process itself. The circling of disciplinary wagons around the notion of architecture that the U.S. Pavilion advances is perhaps most vividly revealed in the constitution of the panels in “Architecture and Change.” The panelists are all faculty members from one of four schools of architecture in the United States, each with a deep stake in the U.S. Pavilion project: the University of Michigan Taubman College of Architecture and Urban Planning is the Pavilion’s institutional organizer and direct recipient of the funding for the Pavilion provided by the U.S. Department of State, while the Princeton University School of Architecture, the Harvard Graduate School of Design, and the Southern California Institute of Architecture are official sponsors of this specific event. These schools are also employers of nine of the visionary American architects displaying work in the U.S. Pavilion. The panels therefore consist of the representatives of four institutions, discussing the work of faculty employed at these institutions, and funded by the same institutions themselves. As the list of the U.S. Pavilion’s sponsors reveals, most of the capital supporting the Pavilion comes from corporations that would directly benefit from the displacement of Detroit’s working-class African-American communities: Shinola is a luxury fashion company, Westin is a luxury hotel chain, and Aperol is a luxury liquor; Dassault Systemes makes Catia and other 3D software that designers use to make luxury architecture; and the Deshler group, Global Transportation Management, and GS3 are different subsidiaries of a single corporate conglomerate supplying the parts and logistics that manufacturers use to make automobiles, luxury and otherwise. The list of the U.S. Pavilion’s sponsors is itself an important text; it illustrates how the Pavilion participates in the current alignment of architectural attention and economic investment that is transforming Detroit into a city of gentrifying consumers and it points to the beneficiaries of the architectural imagination that the Pavilion stages. Who is absent from these conversations? We might suggest that the very communities these processes pretend to aid are both invoked and erased. Architecture can never change in decolonizing and democratic ways without transformative engagement with movement-based activism—the only site of emancipatory agency in our historical conjuncture. This is a proposition that the U.S. Pavilion not only refuses to grapple with but also, with all the talk of “change” floated around it, might actively attempt to displace. You can download a high-resolution version of the image above here.